Place the oil, venison and mushrooms in a large non-stick skillet. Sprinkle in Cajun seasoning, salt and pepper and sauté until the venison has browned. Add the onions and red peppers and continue cooking until just tender. Whisk the egg substitute and the eggs in a bowl, then pour over the meat and vegetables. Stir gently. Reduce the heat to low, cover the skillet and cook until eggs are set around the edges, about five minutes. Sprinkle with cheese and green onions and place under the broiler until cheese is melted and slightly browned. 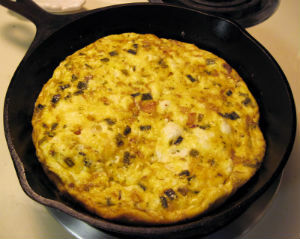 Let the frittata stand for a minute or two before cutting into wedges. Makes a great breakfast or add a salad and use it for dinner.